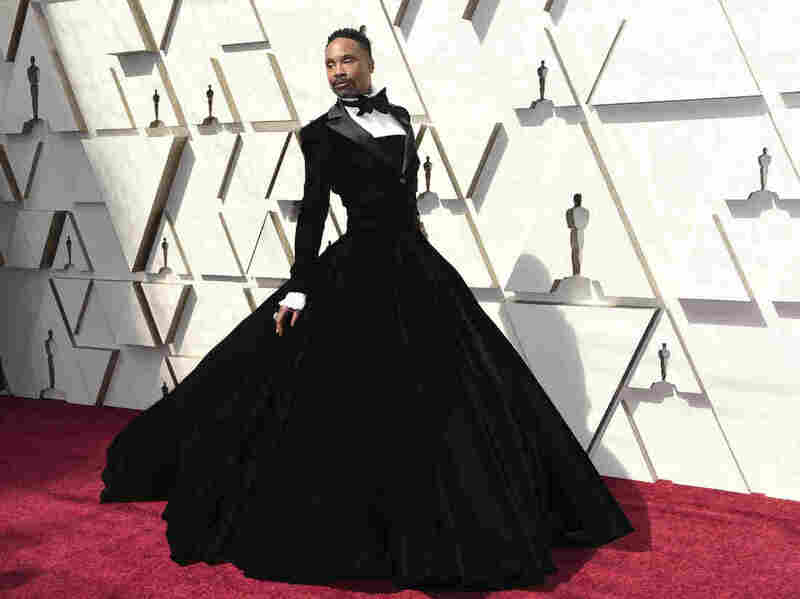 How Christian Siriano Broke The Internet With His Inclusive Design At The Oscars Billy Porter of the TV series Pose wore a gender bending velvet tuxedo gown to the Oscars. "[Porter] just really wanted to wear something that made him feel really good," its designer Siriano said. Billy Porter arrives at the Oscars on Sunday, Feb. 24, 2019, at the Dolby Theatre in Los Angeles. At the Oscars red carpet last Sunday, various stars posed for the cameras in show-stopping fashion: Lady Gaga donned a black Alexander McQueen dress and matching gloves, Rami Malek was dapper in a Saint Laurent suit by Anthony Vaccarello – and Billy Porter wore a velvet tuxedo gown by Christian Siriano that broke gender norms and amassed a huge response across the Internet. This isn't a first for Siriano, who entered the fashion scene after winning season four of Project Runway, becoming the series' youngest person at age 21 to do so. Since then, he has seen staggering success. He designed a dress for Michelle Obama's Democratic National Convention appearance in 2016 and dressed 17 women at the 2018 Oscars. But he's truly known for his willingness to dress people with different body types, at various price points, and has received worldwide praise for doing so. He has a clothing line with Lane Bryant, a national chain for plus-sized women, and consistently uses plus-sized models in his shows. He has partnered with Payless to design inexpensive shoes and also designed numerous items for discount store TJ Maxx. In 2016, he designed Leslie Jones' dress for the movie premiere of Ghostbusters when no one else would, and in 2018 he was named as one of Time's 100 most influential people of the year. While defying norms is Siriano's staple, this time it took him by surprise. "I think [Porter] just really wanted to wear something that made him feel really good. And that was it. Kind of easy," Siriano told NPR's Michel Martin in an interview for All Things Considered. "And we didn't know it was going to turn into what it turned into. We really didn't." I didn't think it would change, you know, what this kind of world of fashion is ... we just kind of were having fun you know and I think he [Porter] felt great. I felt good and we just didn't take it so seriously until we saw what it was doing. And then now I think about it a little bit more and I'm like, oh well, maybe this was something that needed to happen and we didn't even realize how much it really did. There was like a cry for it, you know, receiving all these amazing messages from parents with young kids ... that don't know what they are yet. And can they be masculine or feminine and it's such a huge cultural issue that we have right now going on in our world. The outpour of amazing support and response and literally like reading these parents emails saying that they have a child who is, you know, has kind of an unidentified gender and isn't sure you know, who they are and reading how Billy's gown changed that child's life. I mean, that's something that just doesn't happen every day when somebody shows up on a red carpet. I mean, at the end of the day, red carpets can be quite frivolous and they're just for fun. But I think this was really more just showing that you can be whoever you want to be, whatever makes you feel good, that's what you should wear too. I mean clothes are, we're not curing cancer here, we're putting on a party dress and going out and I think that that's a funny thing that people can take it so seriously sometimes in not a good way, in a negative way. So anyone that took it that way I think sadly, you know, they're just not thinking about it in a broader scheme of things I think. I think in the Leslie instance it was like I thought that that was so unbelievable. I mean, I'm a huge fan of Leslie I'm a huge fan of SNL. I think a lot of the world is. And I just thought that that was so interesting that she was having a hard time finding a dress for a huge premiere. So I was already a fan. So it just was a no brainer. I just didn't really think about it the way ... I didn't know it would turn into this culturally [sic] thing that, you know, people are having a hard time finding clothes or people, you know, designers don't want to dress people. I didn't even know that was a thing. I just thought that it was strange. But I think for me, my team, my world, even how I grew up, it's just that I think I like being immersed with all these different types of people and I think that's what's interesting about this business. So that's what excites me. I like dressing all these different types of women, shapes, sizes, ages. I don't care. I think that's kind of the fun challenge of it. So I look at it that way. There's a few brands that are really trying to champion people not just, you know, obviously women, but obviously just people in general and I think then to see other brands completely disregard it and it's such a strange thing. I mean, I can't imagine. I'm like, what are [sic], the people that work in your office think. That's what I think about a lot. I'm like, I have 45 employees in my office every day, all walks of life. And I can't imagine – I feel like they would be so offended and upset with me if I didn't support these people. So it is a bit strange. So that's what I think about the most. And then I think about like my mom or like my sister you know, my mom is a curvy woman and my sister is a tiny little ballet dancer. So I don't know I think it would be weird to not have something for both of them. So I do think it's a bit strange and other brands they must listen. I mean, the meetings must be unreal. You know it must go through 40 people and then someone made a bad decision somewhere. I don't know. I think this will be the first time the designers have a real designer, a working designer as their mentor. So I think if anything, they wanted a young designer that's in the business right now to hopefully help guide these other younger designers, because that's really what they need. They need real experience. You know if they have a red carpet challenge I can be like well, I just dressed 10 people at the Golden Globes, I think I kind of know something about it. And hopefully, they'll listen to me, so that hopefully, is what I bring to the table this season. NPR's Digital Content intern Lindsey Feingold produced this story for Digital. NPR's Eliza Dennis and Tinbete Ermyas produced and edited this story for broadcast.